The women’s basketball team ended its season with a winning record and a trip to the conference tournament for the third consecutive year. The Coyotes were predicted to finish 10th in the preseason conference poll but they didn’t let that set them back. They used it as motivation to prove everyone in the conference wrong. Coyotes finished the season with a 15-10 overall record. In the California Collegiate Athletic Conference (CCAA), they went 12-8, earning them the no. 5 seed in the CCAA tournament. Only three of the 18 players on the roster were returners. With 16 new players, the Coyotes were faced with the challenge of recreating the chemistry of the previous years team. Other teams in the conference had players that have been playing together for one to three years and didn’t face the same challenge. “Every practice we learned more and more about how everyone plays and it became easier and easier,” stated guard Michelle Okoroike. They started the preseason strong with a six-point loss to Division I Weber state that was followed by a series of wins in Washington. The Coyotes were off to a good start. Their largest winning streak was four wins in early February. In the first round of the CCAA tournament they faced the no. 3 seed, Cal Poly Pomona, whom they had an 0-2 record against in the regular season. They were unable to pull off the win, ending their season with a close five-point loss. Head coach Susan Crebbin complemented the teams work ethic on the court during practices and games. Each member of the team pushed the others to reach their full potential. “Every player had an impact on the success of the team whether they played big minutes or not,” stated Crebbin. What stood out most for the Coyotes was their resilient defense. 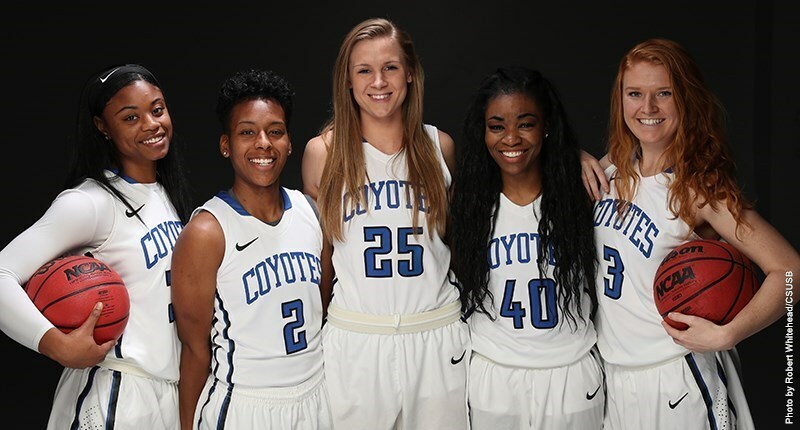 The Coyotes, as a team, led the conference in field goal percentage defense. This means that they held their opponents to a .35 average shooting percentage. Forward Genaya Wilkinson and guard Summer Ramsey were outstanding on the defensive end for the Coyotes. Wilkinson led the CCAA in blocks per game with 1.8, while Ramsey finished second in steals per game with 2.5 per game. Forward Mya Johnson was a standout for the Coyotes. She was named to the CCAA All-Conference first-team. She finished second in scoring, rebounding and shooting percentage. Johnson averaged 16.2 points and 9.6 rebounds per game. She also led the CCAA with 13 double-doubles. In the 25 total games she played, there were only three times where she failed to score in double digits. The Coyotes are now focused on getting stronger in the off-season and fine-tuning their fundamentals. They plan to build on the team connection on and off the court as well as build upon all the positives gained throughout the 2016-17 season.